Item # 311652 Stash Points: 1,295 (?) This is the number of points you get in The Zumiez Stash for purchasing this item. Stash points are redeemable for exclusive rewards only available to Zumiez Stash members. To redeem your points check out the rewards catalog on thestash.zumiez.com. Beef up your sock rotation with the A-Lab Shrooms 2 Pack Crew Socks. This pack consists of two pairs of crew height socks, one green with pink horizontal stripes and an embroidered mushroom image at the upper cuff, the other is black with green, pink, yellow and blue striping along with contrasting pink heels and toes for an additional pop of color. Shrooms 2 Pack Crew Socks from A-Lab. Fits women's US shoe sizes 7-10 US. Contains two pairs of socks. 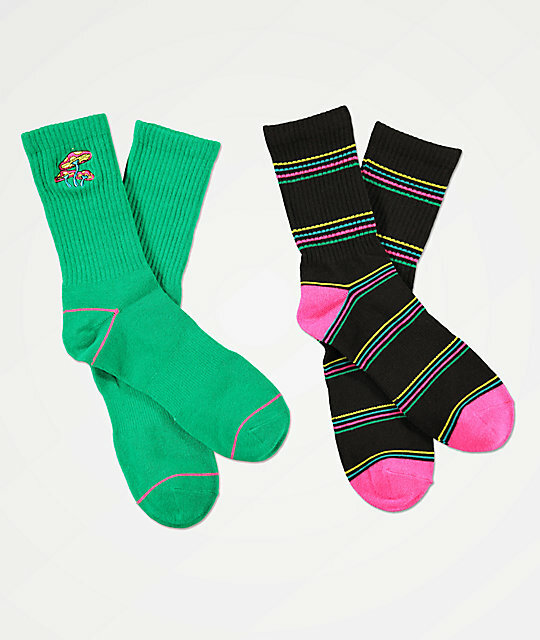 One sock is green with pink stripes and an embroidered mushroom graphic, the other black with multicolor stripes. Athletic ribbed for secure fit. 94% polyester, 4% rubber, 2% spandex.